The ginkgo is a tough tree for urban conditions. Ginkgo (Ginkgo biloba) is a relic from prehistoric times as the only living representative of the Order Ginkgoales, a group of about 18 gymnosperms dating to the Permian period (270 million years ago). During the Jurassic period (213 million years ago) there were 2 to 6 species in the group, and by the Cretaceous period (144 million years ago) there were at least 11 species throughout what is now Asia, Europe and North America. By the time dinosaurs became extinct only one species remained, possibly because those large animals were important for seed dispersal, and the group gradually disappeared from the fossil record in North America (7 million years ago) and Europe (2.5 million years ago). It was thought to be extinct, but was discovered by a German scientist in the late 1600’s in Japan. Rescued from the brink of extinction by Chinese Buddhist monks who cultivated it in their mountain monasteries, and in palace and temple gardens, ginkgo seeds were sent to Japan and Korea in the late 1100’s and eventually made their way to Europe in the early 1700’s and to North America later that century. Ginkgo is a long-lived tree, easily having a life span of 1,000 years or more. In China the oldest ginkgo is estimated to be 3,500 years old. The bark of a ginkgo becomes furrowed with age. This primitive plant has a unique position botanically, as the sole living link between ferns and seed plants, and now has been placed in a separate phylum, the Gingkophyta. Although ginkgo is deciduous it is not related to deciduous broadleaf trees (angiosperms). It is probably more closely related to the cycads than to the conifers. Extract of the dried leaves are used as an herbal medicine. Studies show that ginkgo may improve blood circulation and memory, and prevent bloodclotting. 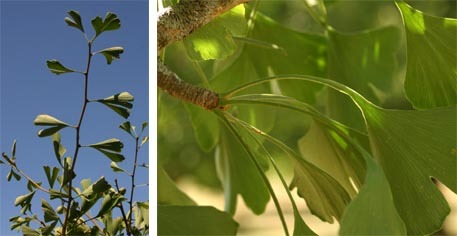 Ginkgo has distinctive, fan-shaped leaves. Ginkgo is now grown around the world as an ornamental tree. It has a slow (especially at first) to medium growth rate and can develop into a large tree 50 to 80 feet tall. It has an open growth habit and sparsely branched, upright columnar form when young, but fills in to become more upright and spreading with age. Trees may attain a very large size, with a trunk over 3 feet in diameter. The largest living ginkgo on record in Wisconsin (on 13th Street in Monroe) has a trunk circumference of 192 inches, is 75 tall and 85 feet wide! They are popular in urban areas because they are tolerant of a wide range of conditions, including salt spray and air pollution. 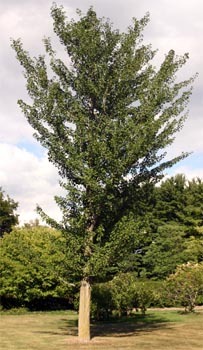 Hardy in zones 4 to 8, they can be used as a shade tree in a mixed grouping or as a specimen in an area that can accommodate their large mature size. Although they are tolerant of tough urban conditions, they are best not used as a street tree because they will eventually grow much too big. Leaves arise from both terminal stems (L) and short spur shoots (R). 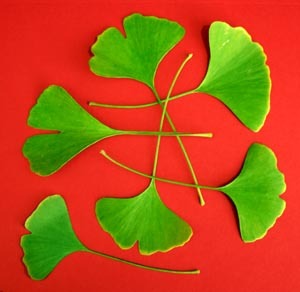 The ginkgo’s most distinctive feature is its fan-shaped (“obovate”) leaves. Each leaf is up to 3″ long, with slightly raised veins (producing almost a ribbed appearance), generally with a single vertical slit in the top center, and on a petiole that is also up to 3″ long. The leaves are clustered on numerous short spur shoots or alternate along the terminal stems. Because of their shape and long petiole, they flutter in the slightest breeze. In fall the foliage turns yellow – this may be anything from chartreuse to gold, depending on conditions and the cultivar. They remain on the tree until late in the season, then drop all at once. The leaf shape is similar to that of maidenhair fern (Adiantum), giving rise to the common name of Maidenhair tree. Ginkgo fruits on the tree (L and LC) and fallen on sidewalk (RC) with dropped and smashed fruits (R). 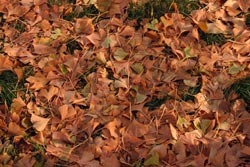 Fallen leaves are brown rather than gold because of drought stress. Plant ginkgo in full sun. Although it prefers moist, deep, well-drained soils, it readily adapts to poor, compacted soils and tolerates drought (although it should be kept well watered until fully established in a few years). Fall leaf color is often not as good when trees are drought stressed. This tough tree Transplants readily, and is easy to establish, has few insect and disease problems, and can handle snow and ice. 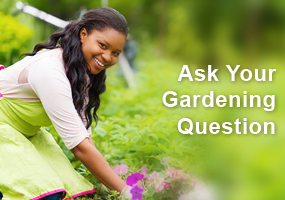 Although you can grow ginkgo from seed (in which case you will not know the gender for at least 20 years until you see what type of flowers are produced), purchased plants are propagated primarily by cuttings from male cultivars grafted onto seedling rootstock. There are many varieties, although few are readily available. 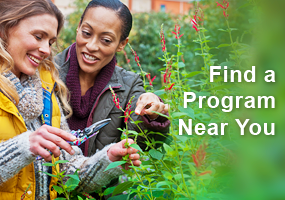 These cultivars are always non-fruiting (male) and were selected for improved fall color and/or modified growth habit. ‘Aurea’ has yellow leaves throughout the growing season. Autumn GoldTM is one of the more commonly available cultivars, with more dependable golden-yellow fall color than the species and a faster growth rate than some. It has a broadly pyramidal growth form at maturity and tends to be a little more compact than the species, attaining a size of approximately 50 feet tall by 30 feet wide. Ginkgo ‘Autumn Gold’ through the seasons. ‘Canopy’ has a spreading crown. Ginkgo ‘Canopy’ through the seasons. ‘Chase Manhattan’ is an extremely dwarf form, ideal for bonsai and rock gardens, with small, tiny dark green leaves. It is very compact, growing only about 5 feet tall. ‘Fairmount’ has a slender form, big leaves, and a dense pyramidal crown. It grows to 50 feet tall. ‘Magyar’ offers uniform symmetrical branching in an upright narrow pyramid form. This cultivar may attain a height of 60 feet. ‘Mayfield’ is another columnar form, with tight upright, short branches, maturing at 60 feet but only 25 feet wide. 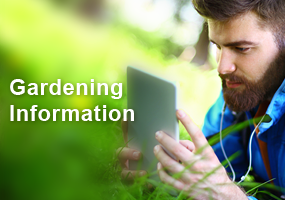 Princeton Sentry® is a well-known, nearly columnar form with larger leaves. It is best used for a vertical accent. It matures about 70 feet tall by 10 feet wide. Shangri-laTM is a pyramidal tree with bright yellow fall color. It grows to 45 feet tall and spreads about 25 feet. ‘Variegata’ has yellow variegated leaves. My parent’s Ginko tree is 50 years old and has a trunk girth of 106 inches. It is approximately 40 feet tall. They live just north of Milwaukee.